Prostrate Justicia is a prostrate herb with stem angled, velvet-hairy. Leaves are opposite, ovate to nearly round, 7-13 x 6-8 mm, rounded-wedge-shaped at base, entire at margin, blunt to somewhat pointed at tip, velvet-hairy along the nerves beneath. leaf-stalk 2 mm long. Flowers are borne in spikes at branch-ends, up to 2 cm long. 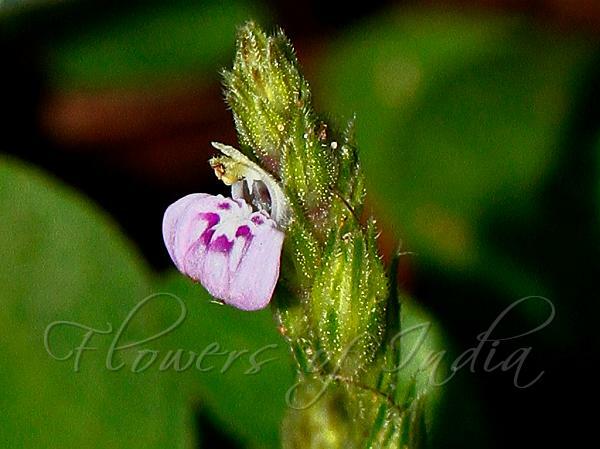 Flowers are about 7 mm long, pale pink, 2-lipped, tube 2 mm long, lower lip 3-lobed, ovate, upper lip broadly obovate, hairless. Bract are lanceshaped, 3.5 mm long, membernous, rough along the margin; bracteoles linear, 2 mm long, membranous, rough along the margin. Calyx is 4-partite, erect, sepals linear-subulate, 3.5 mm long, fringed with hairs at margin.Capsules are oblong, 2.5 mm long, bristly-hairy; seeds 2-4, obovoid, minutely papillose. 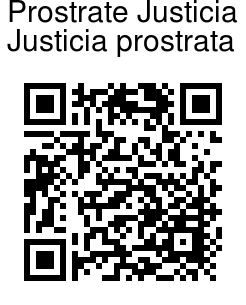 Prostrate Justicia is foun in Peninsular India and Sri Lanka. Identification credit: P.S. Sivaprasad Photographed at the outskirts of Coimbatore, Tamil Nadu.